We've all heard how vital it is to be well rested, even though most of us don't acknowledge that fact. Getting too little sleep can be harmful to your health, but sleeping too much can also boost your risk for diseases. For instance, conditions such as obesity, cardiovascular disease as well as a weakened immune system have all been attributed to a lack of sleep. The amount of sleep an individual needs can vary considerably over the course of his or her lifetime. It depends on one's age, activity level, his or her general health and lifestyle habits. • Diabetes, Obesity and metabolic disorders including metabolic syndrome (Centres for Disease Control). • Alcohol and medications may also cause one to oversleep. However, one should never stop a prescribed medicine if he or she has been diagnosed with a medical condition. • Although Insomnia is linked to depression than oversleeping, roughly 15% of people with depression sleep too much. This may in turn make their depression worse, since regular sleep habits are an essential part of the recovery process. • Thyroid disease, Kidney disease, Liver disease and Dementia. • Long periods of sleep are associated with accelerated cognitive decline in older adults (Research at Spain's University Hospital, Madrid & New York's Columbia University). 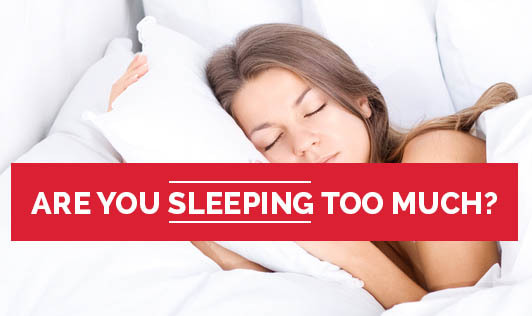 The information given above is taken from the National Sleep Foundation that gives you an idea of how many hours of sleep individuals of different age groups need. Nevertheless, it's important to pay attention to your own needs by assessing how you feel on different amounts of sleep. For instance, are you productive, healthy and happy on seven hours of sleep? Or does it take you nine hours of quality sleep to get you into an elevated gear? Do you have other health issues? Are you experiencing any sleep problems? Do you feel sleepy when you're driving? Are you at a risk for any disease and do you depend on caffeine to get you through the day? These are some questions that one must ask to himself before he finds the number that works for him. There is still a great deal of research required with strong evidence in order to determine that sleeping too much has detrimental health consequences. "Don't mistake sleeping more with sleeping better. For the best sleep for long-term health, aim for a not-too-little, not-too-much middle ground, says Michael Breus, the Sleep Doctor." If you have sleep problems, see a doctor who will be able to help you determine why you sleep too less or oversleep.